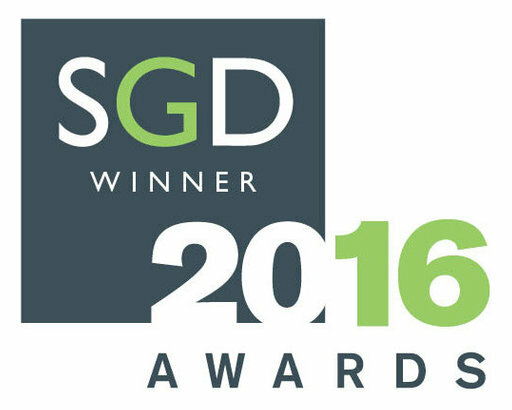 Society of Garden Design 2016 Winner. The judges said: "A good use of space and interpretation of the brief. The theming was bold, without feeling imposed. 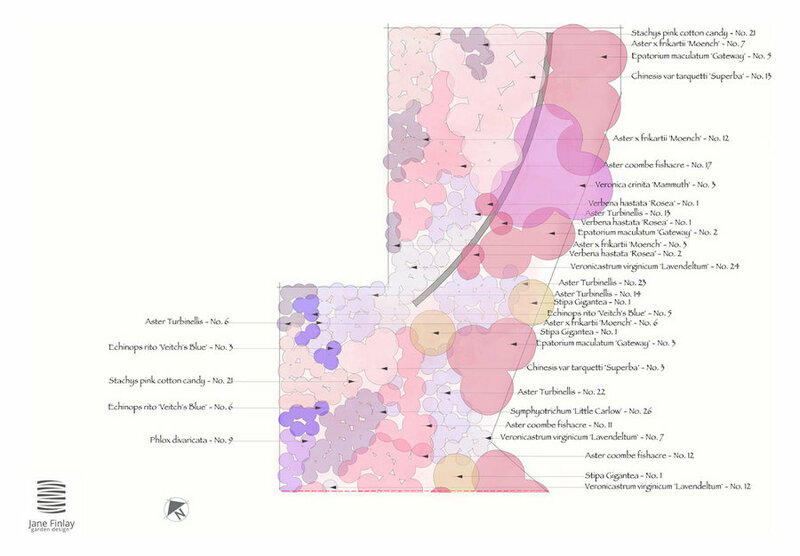 Strong graphics that enhanced the narrative, including some very useful sectional elevations”. Excerpts from this design give an example of a concept inspired by art; in this case Rothko. 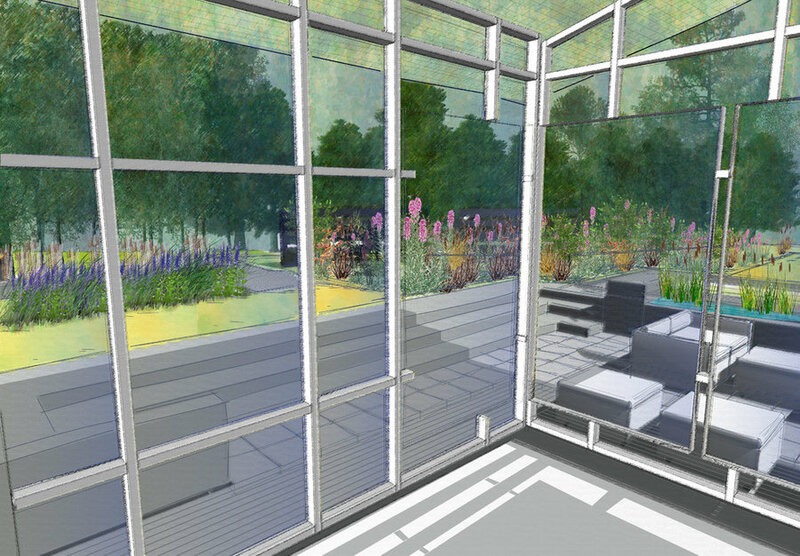 This garden design for 2 acres in Surrey, supports the modern architecture of a Huf Haus the client proposes to build. The client's taste is for vibrant modern art/interior decor. Rothko is a favourite artist. The creation of a woodland edge and blending of heathland style plants on the outer perimeters of this garden create a calm. Decking walkways of weathered grey will organically link the house to its habitat and invite exploration. 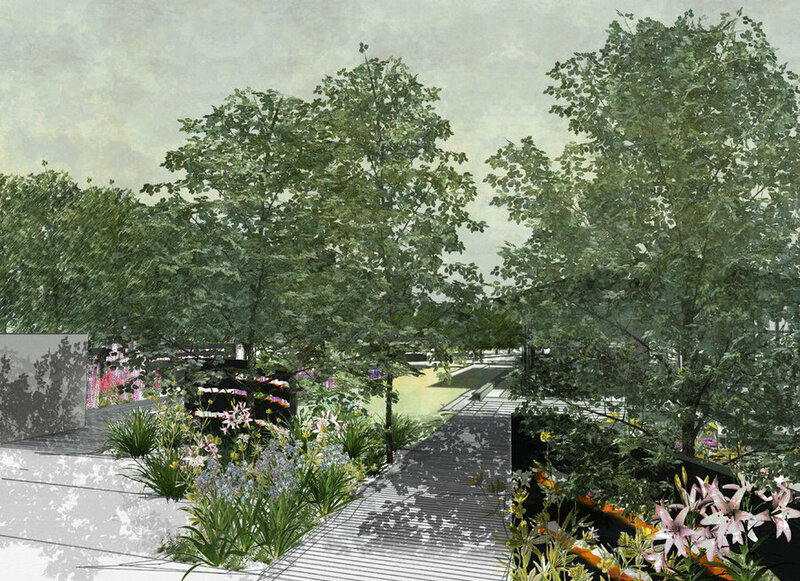 Within the geometrically designed garden, plantings will smudge together and soften edges. Layered colour and texture as in the richness of Rothko will have a re-energising effect just as the art itself does. 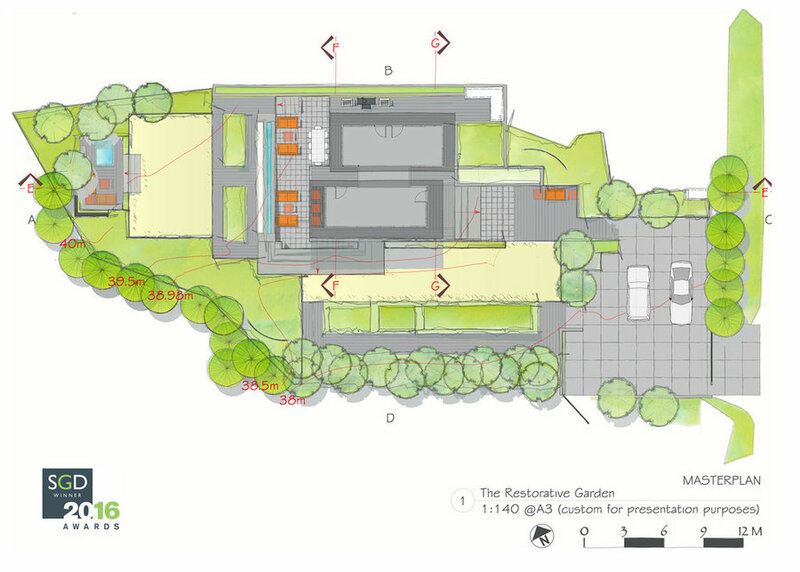 A sense of arrival from the redesigned parking area: circulation through garden and woodland area or down steps and into the house. 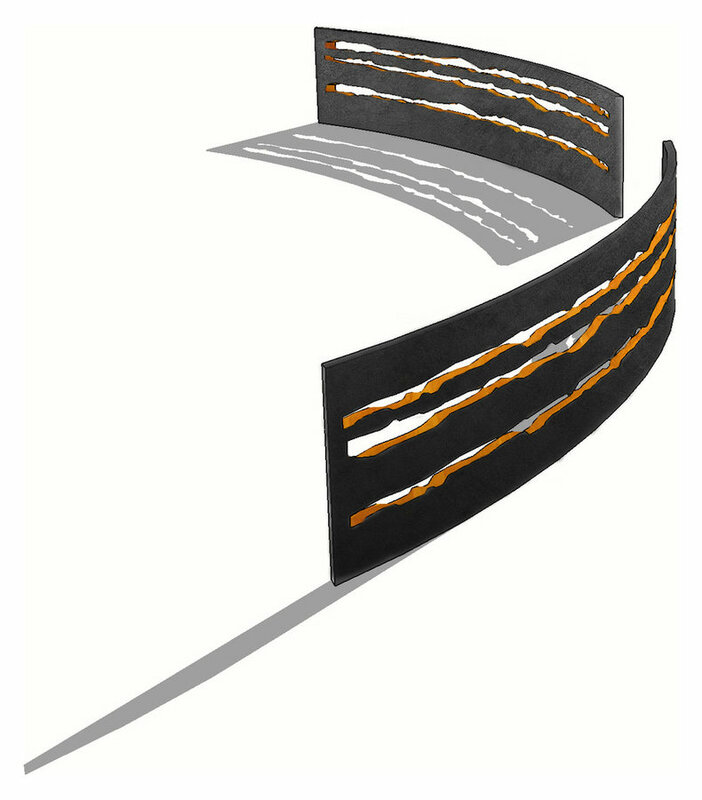 This drawing shows the slithers inspired by the spaces between Rothko rectangles. 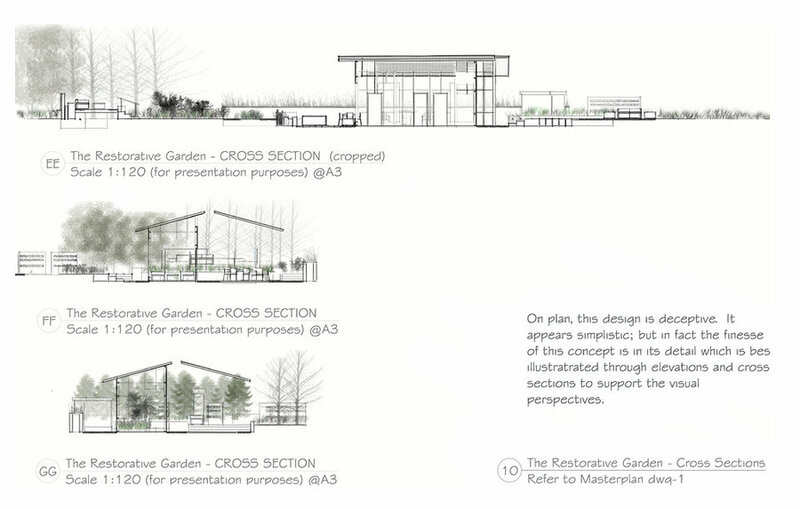 In the design these screens bring fluidity as they thread through the woodland edge and other planting to provide screening where needed. The view from inside the house outward (now positioned 3-steps down) looks over two aspects of the garden. 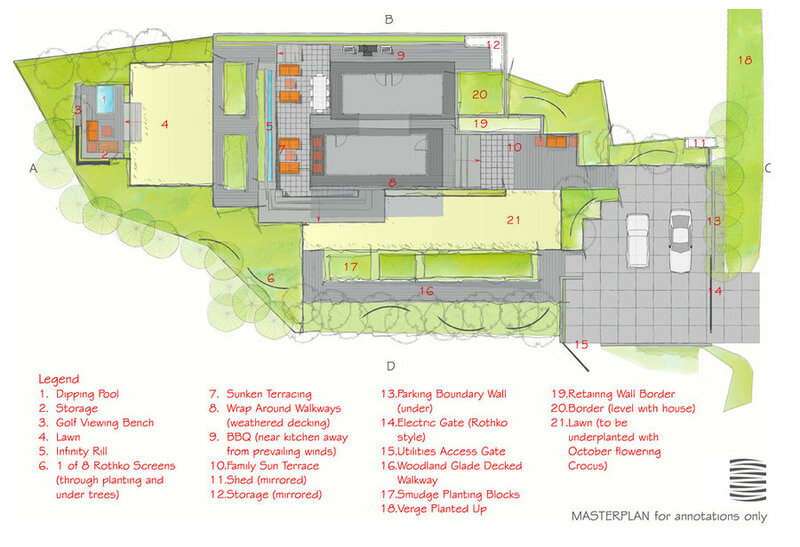 The now tree screened golf course & adjacent planting and the entertainment terrace with its infinity rill (plus the walkways that wrap around the house can be seen). The viewing platform is a retreat that takes advantage of views to distant hills the boundary immediate golf course. It includes a dipping pool and storage under lift-up bench seating behind the sofas. Planting is integral and within. 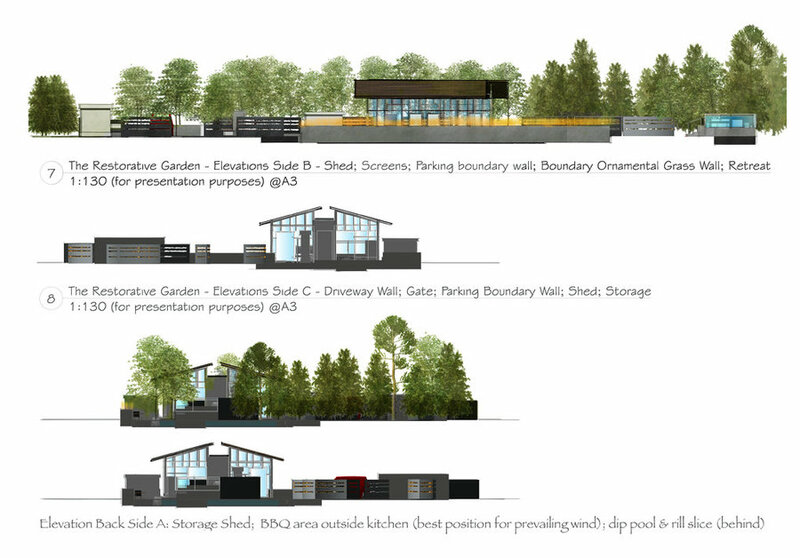 Paired elevations showing view with and without trees. Top: Side B. 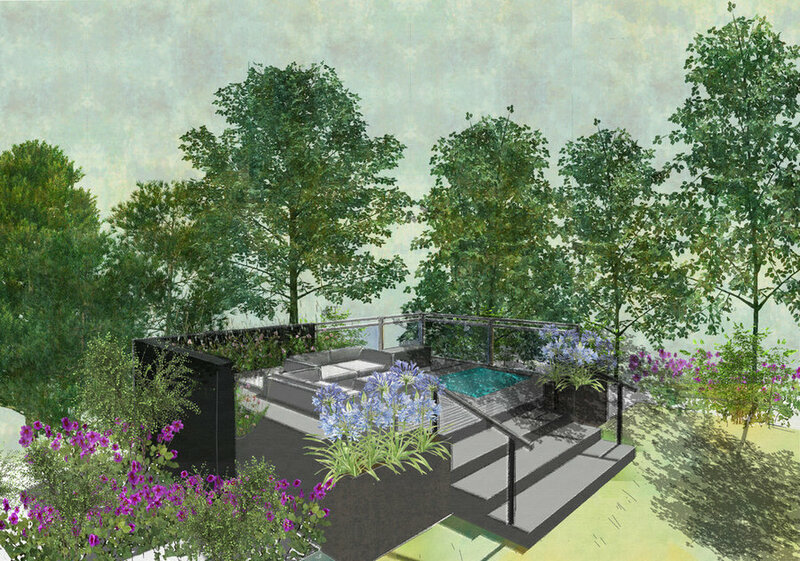 Garden shed; Rothko screens; retaining grass planter wall; retreat/viewing platform & dip pool. Below: Side D. Retreat/dip pool; planter (adjacent); sunken terrace/furniture; retaining grass wall (beyond through house); Rothko screens. 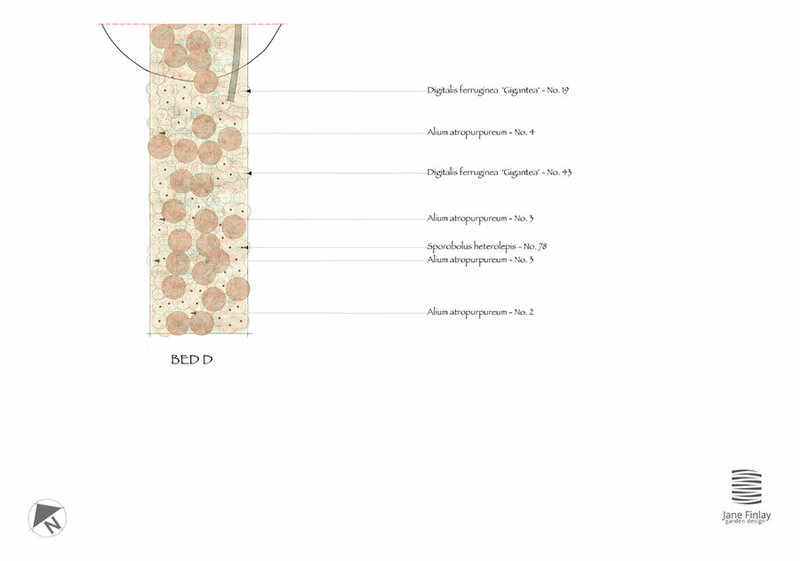 Cross sections to illustrate levels. Winter views. Annotated plan to the right. Top - EE; Centre - FF; Bottom - GG. The Masterplan. Notice the rhythm of the Rothko screens threading below the trees and wrapping around to the right of the plan edging the parking bay. Weathered decking tracks alongside the woodland edge and as a house surround. 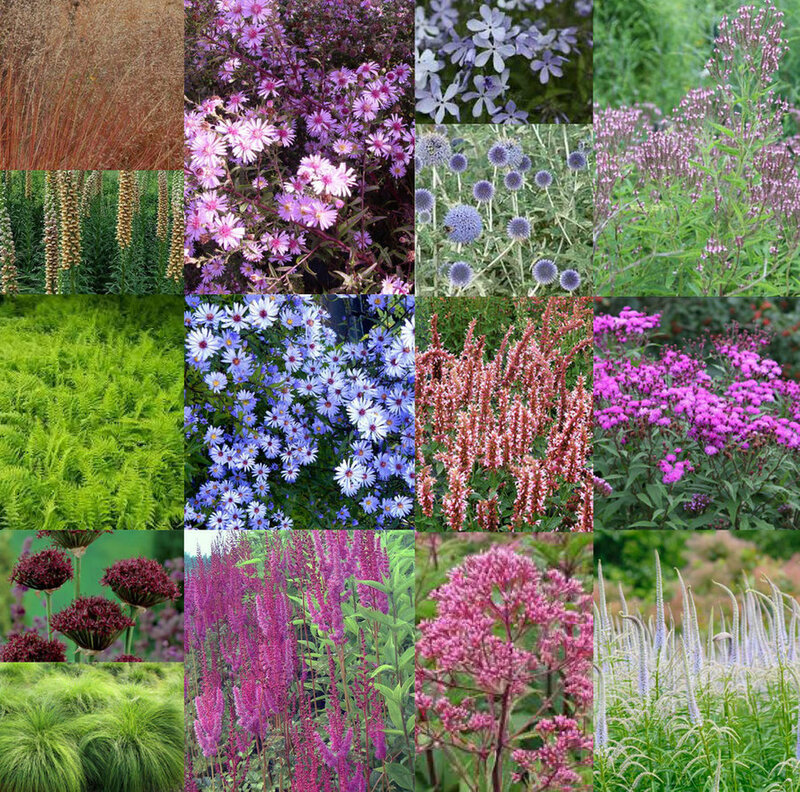 A photo-montage to capture the mood of the planting for border D.
A planting plan which is colour themed. This is 1 section of a three. 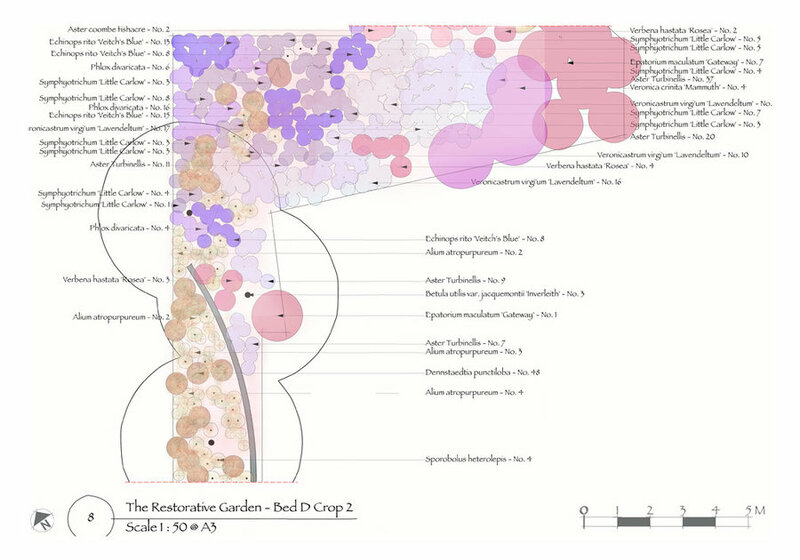 Section 2 of 3 for the colour themed planting plan; the colour plan changes gradually towards the bottom as it progresses towards the outer perimeter/more natural part of the garden. Section 3 of 3 for this planting plan.